Yes, they would seriously detract from the hundreds of colonial automobiles parked on colonial asphalt underneath all those colonial Resident Parking signs when their drivers (garbed in breeches, no doubt) aren't busy stopping for colonial traffic signals and colonial stop signs. I happened to stop by Beacon Hill this weekend and it reminded me just how hypocritical, stuck-up, and snobby these BHAC cretins are. Here's Bowdoin Street, near the edge of the historic district, where a historic six-lane highway leaves hardly any room to pass by on the sidewalk. Apparently, this scene does not "smack" Mark Kiefer "of modernity" at all? 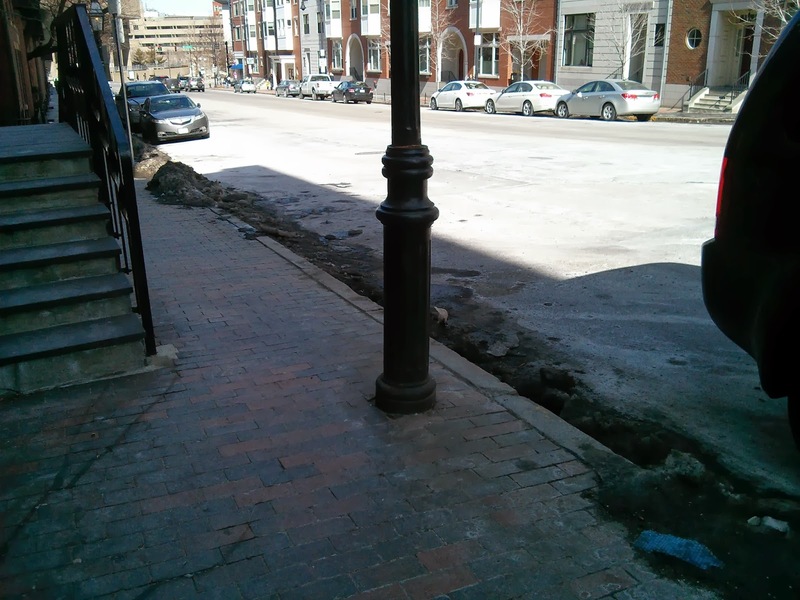 Historic SUV parked on historic asphalt next to charming lamppost blocking historically small sidewalk. Approximately 75% of the street width is devoted to automobiles and fast-moving vehicular traffic. 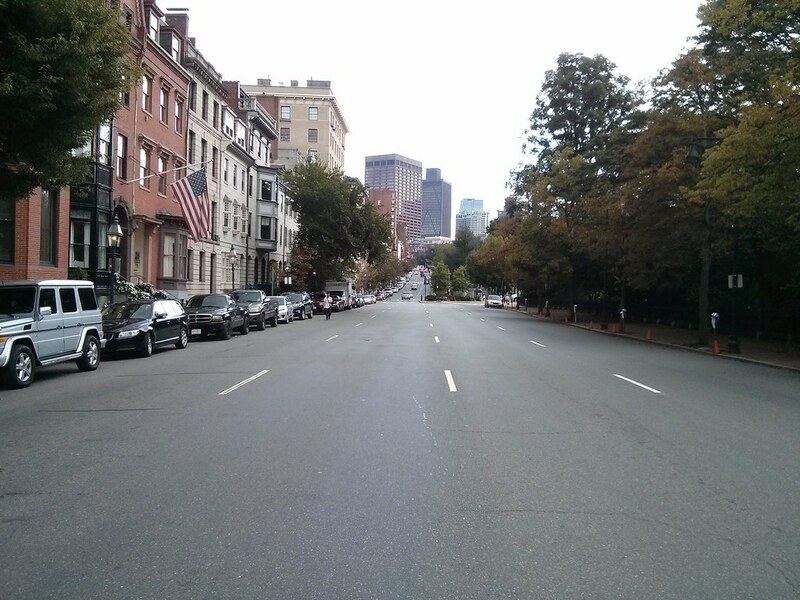 Bowdoin Street is 60 feet wide from curb-to-curb, easily enough for 4 travel lanes and 2 parking lanes. Or maybe it should be 4 horse lanes and 2 horse post lines. Because history. Anyway, BHAC is curiously silent about the heavy presence of parked cars and speeding vehicles on this street, while people walking try to squeeze by scattered obstacles and bottlenecks. My impression of Bowdoin Street is that it is a half-victim of urban renewal, actually. It was originally constructed as a 40-foot street in 1727. I haven't found records of the widening, but, the far side of the street all looks like relatively newer construction with a historic-looking facade. If I had to take a guess, I'd say this is probably a victim of the Boston City Planning Board's insane zeal for street widening at any cost. Or, maybe Ed Logue and the BRA, since it is Government Center-adjacent. Whichever way it came about, here's how I'd describe it: not historic. Massive motorway -- tiny, oft-obstructed sidewalks. Ridiculous. Nothing more historic than a four-lane highway. Right? Beacon Hill does have some truly charming and wonderful streets. And even a historic feel, if you can overlook the omnipresent automobiles. But it's completely insane for the snobs at BHAC to be complaining about handicap ramps, unless they are prepared to stand up against all the BMW and Lexus owners who litter the historic streets. And while we're at it: modern plumbing and electricity too. Beacon Hill wants to pretend to be some kind of half-museum: pro-preservation, but only when it's convenient. I understand the desire for historic preservation. I am, after all, a huge fan of narrow, medieval-style streets, such as those still found in some parts of Beacon Hill. I realize that historic preservation movements managed to save some parts of neighborhoods from the horrors of urban renewal and modernism. But there's a point where the movement becomes self-parody. This is one of those points: when cars are treated with more respect than people, the neighborhood has lost its way. Remember the reason why historic preservation resonates with people: it's because the architecture of the latter 20th century is so terribly inhuman. Therefore, we cling to anything from the past, to buildings built during a time when designers still remembered how to relate to the human beings walking on the street. In a way, we're still stuck in the architectural Dark Ages, trying to feel our way out, trying to relearn was what forgotten during the modernist era. But one new idea that we do have right, in law if not in fact, is the notion that the city should be accessible to all its citizens. Beacon Hill, get your streets in order. Put people first.